“Access to decent and full employment will enable persons with disabilities to remain out of poverty and to become contributing members of the family and in the society,” said Pradeep Bagival, UN joint programme coordinator of the Disability Rights Initiative Cambodia (DRIC). In August 2010, the Cambodian government issued a sub-decree to the Law on Protection and the Promotion of the Rights of Persons with Disabilities stating that at least 2% of the public sector workforce, including schools, hospitals and government departments with more than 50 employees, should be comprised of people with disabilities. 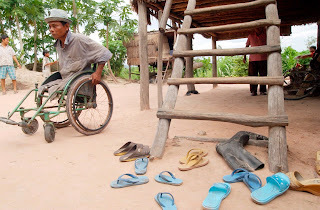 This 2% target represents the government’s official estimate for the number of Cambodians with disabilities, although critics contest that this is too low, especially when taking into account the World Health Organisation estimate that the rate of disability in the global population is 15%. The government sub-decree also set a quota for private businesses with more than 100 employees, who were ordered to ensure that 1% of their staff was made up of disabled workers. Both the public and private sector were expected to fulfil the quota within three years. Nearly three years on from the deadline, there is currently “no accurate data” on how many people with disabilities are employed in general in Cambodia, according to Bagival. Although, he added, the latest statistics show that of the 194,596 civil servants working in 40 government agencies, 2,460 have disabilities – roughly 1.3%. Ngin Saorath, executive director of the Cambodian Disabled People’s Organisation, said that he was disappointed that the quota of 2% has not been met, but stressed that it depends on locality. In 2013, he told the Cambodia Daily that, at the time, 1.85% of all public sector employees in Phnom Penh had a disability, but “very few” were working in provincial areas. “Young, urban people with disabilities have more chance [of finding a job] than rural people,” he told Southeast Asia Globe. Article 15 of the sub-decree stipulates that fines of 50% of a civil servant’s monthly gross salary would apply at state institutions and 40% of an employee’s minimum monthly salary at private companies that failed to meet their quotas. According to Bagival, fines should be imposed for every separate instance when a disabled person has not been hired in line with quotas. He added that the fines, however, would not be levied on the institutions at fault but the individuals in charge – the CEO of a company, for example, or the minister who heads a given ministry – who would be expected to pay out of their own pocket. However, Southeast Asia Globe has found that, to date, not a single fine been paid for failing to meet these quotas. Fines are supposed to be paid to the Persons with Disabilities Fund, now called the Persons with Disabilities Foundation (PWDF), which is under the control of the Ministry of Social Affairs, Veterans and Youth Rehabilitation. The government-affiliated PWDF funds services for people with disabilities in areas such as health, rehabilitation and education. According to a senior development worker within the field, who requested anonymity, the Disability Rights Administration (DRA), which is part of the social affairs ministry, is tasked with imposing fines for non-compliance and the PWDF is charged with collecting them. “So far, the PWDF has not been able to collect any amount since the implementation of the quota system and the DRA has also not imposed any fines so far,” the development worker said. This was confirmed by Chuor Rattanak, director of the PWDF, who said in a text message that the foundation has received “zero riels” from fines. According to the anonymous source, staff members at the DRA have spoken privately about being unaware of how to file a claim against a government body or private business to impose a fine, adding that all of this “makes the quotas pointless” and suggested that it is most likely the fault of a government not willing to take this issue seriously.